Attractive world map showing the routes of the great explorers. A General Chart of the World on Mercators Projection exhibiting all the New Discoveries and the Tracks of the Different Circum Navigators. 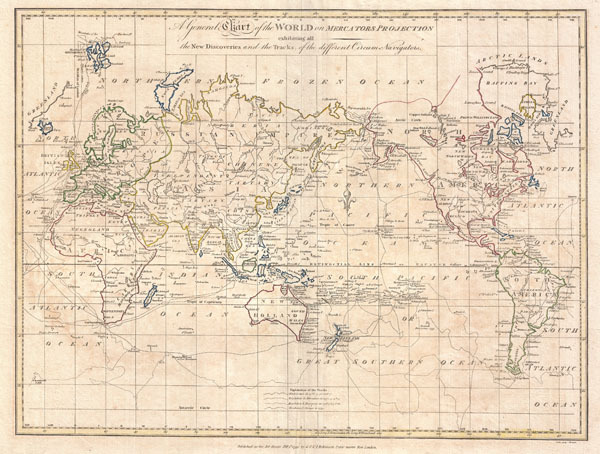 A fine example of Clement Cruttwell's 1799 map of the world on Mercator's Projection. This is an elegant world map designed to illustrate the activities of important explorers of the 17th and18th centuries. The tracks of Cook, Anson, Bourgainville, Wallis, Furneaux, and others are noted. Cook's work in the late 18th century, being of extreme importance, is emphasized. Cartographically this map follows established convention but does feature the most recent discoveries of Cook and Vitus Bering in the Arctic, which are featured at top center. Inland detail is somewhat minimal and focuses on important cities and countries. There are however, a few anomalies worthy of note. Tasmania is attached to the Australian mainland. Japan is incorrectly aligned along the horizontal. The sea between Japan and Korea, the name of which is currently being disputed between Korea and Japan, is here identified as the Corean Sea. Antarctica, which has not yet been discovered when this map was drawn, is absent. The whole exhibits delicate outline color and fine copper plate engraving in the minimalist English style prevalent in the late 18th and early 19th centuries. Drawn by G. G. and J. Robinson of Paternoster Row, London, for Clement Cruttwell's 1799 Atlas to Cruttwell's Gazetteer. University of Southern California, Sea of Korea Map Collection, EAMC-82.